There’s nothing quite like the wonderful warmth of our Floridian sunshine. People travel cross-country to experience it and hope to leave with a golden tan that their friends will envy. Unfortunately, your carpets and furniture aren’t such big fans of this sunshine and would benefit greatly from UV window film. But how does it work? And what are UV rays anyway? We’ll take a look at this dark side of the sun and why UV window film is the optimal form of protection. The great big ball of fire in the sky that we call the sun emits various type of light. Infrared rays warm us up and are generally harmless. However, Ultraviolet (UV) rays are not so friendly. These rays only make up about 10% of total sunlight output, but they are extremely powerful. That tan may look great, but one must also consider the effect it may have on one’s health. Too much exposure to UV rays from the sun can cause skin cancer. You may think that your family is avoiding these rays when indoors, but windows still let them in. Lounging in your favourite armchair may not be as safe as you think. Your carpets and furniture are just as vulnerable and if they spend hours each day sitting near a window, you can be certain that the UV rays will cause them to fade over time. The interiors of your cars and boats are also at risk of damage by these harsh rays. To shield against these rays while still letting in other forms of sunlight, one would need to filter it out by preventing UV’s specific wavelength from travelling through the glass. Thankfully, a perfect solution exists. Once you realize that you need UV protection, you’ll soon come to the conclusion that UV window film is the way to go. The film is specially designed to filter out harmful rays using materials such as charcoal, silver, nicrome and ceramics. It can also be customized to let in the desired amount of visible light, or to appear opaque which can provide privacy. In addition to these aesthetic benefits, the film also strengthens glass which improves security, and increases safety by preventing hazardous glass shards flying about when the window breaks. The film can also reject up to 75% of solar heat, reducing the energy required to cool your home. This reduces your energy bill – who doesn’t want to save money? After applying UV window film to your windows, you’ll find that they are able to block 99% of harmful UV rays. This gives you peace of mind that your family, furniture and carpets are protected. One should view UV window film as an investment in personal health and the aesthetics of your furniture. Replacing faded carpets and furniture is no minor expense. The process to install the window film involves careful, precise application. 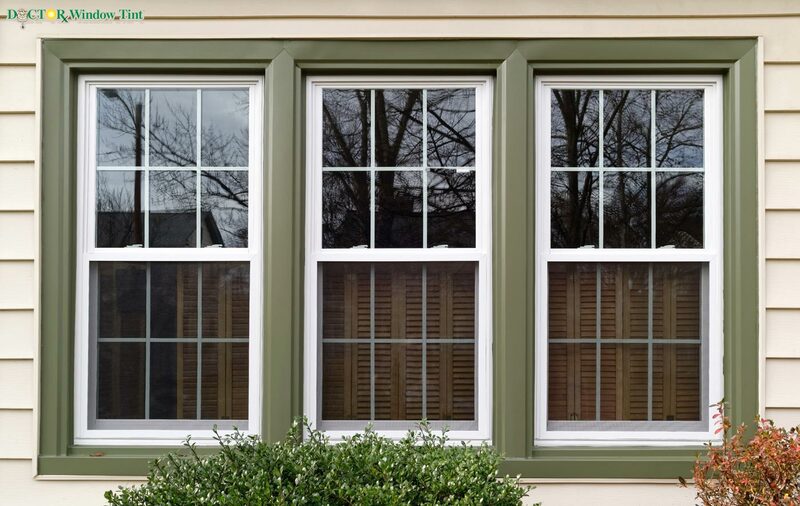 If the film is applied incorrectly, it will not perform as required, it will deteriorate more quickly and it will damage the aesthetics of your windows. You wouldn’t want to have to buy another film to start over – then you’re just throwing away money. That’s why we always recommend that you call up a professional to get the job done. At Dr. Window Tint, we’ve been installing UV window film since 1980 and we know how to install your film right the first time so that you don’t have to spend more money on reapplication in the future. As mobile window film installers, we’ll come directly to you to fulfill your window tinting needs and convenience for the customer is at the top of our list of priorities.